When reading a great article from the creators of Soma Water about how they raised $100,000 in 10 days on Kickstarter, the shared the idea of this share-page that they sent to their closest friends & supporters to ask them to share the project with their friends. The little landing page was cute, functional, and very simple. 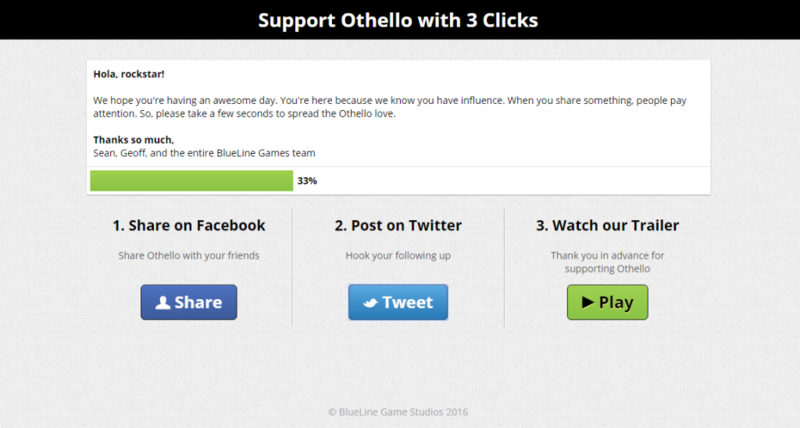 I thought it’d be great to do something like this for the launch of Othello on Steam. Since the source was all right there & formatted beautifully, I figured it’d be worthwhile to make a PHP script that would output the same kind of page based on a very easy configuration so that non-coders could get that great landing page with very little effort or programming ability. Download the simpleShare.zip and unzip it. If you don’t know what these hashes are for, just ignore them. In the folder you just extracted, there is an index.php file with configuration code at the top which you have to fill in. The comments will help you figure out what to put there (there is also an example). Open index.php in a text-editor to do the configuration. Place the entire “share” directory on your webserver where you want the page to be located. All this page should require in order to work is a PHP server and the directory that we provided in the zip file above. Made the entire thing configurable at the top of the file so you only need to look in one spot. Made the single script capable of building the share pages for multiple projects (so you won’t need a separate copy of this tool for each project; just an extra section in the config). Updated the google analytics code to the more recent code. If the configuration wasn’t set up yet, hitting the page will show instructions on configuring it. If more than one project exists, but none was specified in the URL, will show a list of projects. If you are in a sharing mood and want to share the project that resulted in us making this page, please check out this page: share Othello. This entry was posted in Web Development and tagged free, marketing, open source, php, promotion. Bookmark the permalink. “Simply Chess” – now free to play on Steam! Like being kept in the loop?